Looking for a reliable landscaping company in Northern Virginia? Whether you need a new drainage system or need help with a major lawn renovation, O’Grady’s Landscape has you covered. We handle landscape issues big and small and our skilled staff has extensive experience designing effective and affordable solutions for all types of properties throughout the Northern Virginia area. When you choose us for your landscaping project, you can rest assured that we’ll respond promptly to your request for a consultation and get you an estimate within a week. Then, we’ll continue to provide you with a high level of support through completion of your project so you won’t be left with any surprises when we’re done. Call us at 703-533-5001 to schedule a consultation for landscaping in Northern Virginia and we’ll give you—and your landscape—the attention you both deserve! Grading and drainage. The grading and drainage process is critical to preventing backyard flooding, water entering your home, and an array of similar issues. It begins with grading to ensure your landscape has the proper slope for drainage. Then, new drainage systems are installed to redirect water runoff and help you maintain a strong landscape foundation. Dry creek beds/swales. Dry creek beds are ideal in properties that have slopes where excess water runs, redirecting runoff as needed. Erosion control. If you have a sloped landscape, erosion control can help protect your favorite hardscapes by preventing soil and rocks from sliding and damaging them. Mulch and grass are just some examples of the materials we’ll use during this process. Sod installation. If you want to install a new lawn quickly, we can lay sod, which also prevents soil erosion. 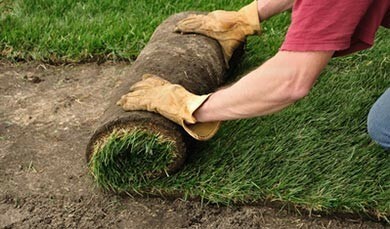 Sod can also be used to repair a small part of your lawn. Lawn renovations. This is ideal for those with lawns that are older, damaged, or of poor quality. The process typically involves planting grass seed, often including new varieties that can help repair damage or increase tolerance to shade and wear. We can also help you with transplanting, which involves repositioning plantings within your landscape. Need help with another aspect of landscaping you don’t see listed above? Learn more about our lawn care and landscape maintenance services in Northern Virginia here and see how we can help you maintain a healthy, green lawn! Do you have damaged, dry grasses detracting from the look and feel of your property? Or draining issues that leave you with backyard floods and puddles after each storm? O’Grady’s Landscape has the solution you need to maximize functionality and make your landscape look beautiful once again! Serving homeowners in and around the Northern Virginia area, we are dedicated to providing you with all the landscaping tools you need for a lawn you can be proud of. So don’t neglect your lawn any longer! Let us help you with all aspects of landscaping in Northern Virginia so you can leave an impression on all your guests—call us at 703-533-5001 to schedule a consultation today!